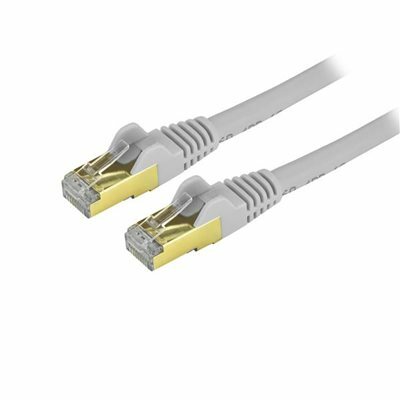 This Cat6a cable meets or exceeds all Category 6a cable specifications to ensure reliable 10Gb network connections. The cable is shielded to protect your network against electromagnetic interference (EMI/RFI) and system noise, providing the perfect solution for fast and safe network connections.Find the length and color you needThis 25-foot gray patch cable is perfect for use in network conduits and raceways. The cable is intended for longer distance applications, such as running up a post or throughout the office from a hub to a wall jack.For easier network installations, our Cat6a patch cables are available in a wide variety of lengths and colors. This ensures you have the right size of cable available when you need it and it lets you color code your connections for a more organized setup.Reliable Cat6a 10 Gigabit connectionsEach cable is tested for up to 500MHz frequency and is more than suitable for 10GBase-T Ethernet networks.Constructed with 100% copper and foil-shielded, twisted-pair wiring, this cable was built for quality performance. The cable is designed to keep the data signals traveling through your network free from interference and is perfect in environments that are prone to large amounts of EMI.The 50-micron gold connectors deliver optimum conductivity and eliminate signal loss due to oxidation or corrosion.Snagless RJ45 clips help protect your network connectionsFor trouble-free cable runs, this durable cable features snagless connectors that protect the RJ45 clips during installation, making them less likely to snag or break.The cable also features molded boots which offer connector strain relief by stopping the RJ45 connector termination points from bending at sharp angles. This reduces the risk of damage to the cable, which could decrease network connectivity and performance.